A new discovery from SDSU’s Donald P. Shiley BioScience Center finds the synthetic protein EP67 helps kick-start the immune system, preventing the flu. Edward L. Morgan, Ph.D, Research Professor of Biology and member of the Donald P. Shiley BioScience Center at San Diego State University passed away May 31, 2012. 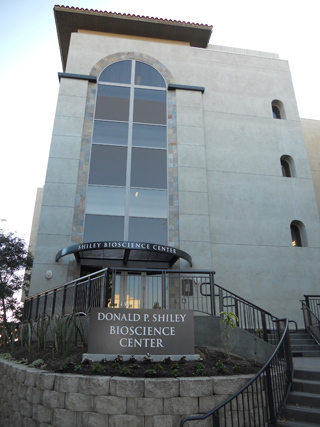 On March 6, 2012, we celebrated Darlene Shiley's visionary gift, naming the Donald P. Shiley BioScience Center in honor of her late husband. Donald Shiley was an inventor and innovator whose philanthropic investments in arts and education have enriched many lives. “Because the BioScience Center project was of great personal and professional importance to them, it seemed appropriate to give Stephen and Susan a significant going-away present in tribute to his masterful presidency..."
A consortium has been established to explore the development of a new and novel approach for the development of vaccines in both young and aged individuals. A new imaging system will help track the spread of disease and damage after a heart attack. The Domino Effect: Surprising Links Between Infection and Heart Disease. The entrepreneurial side of the BioScience Center is emerging. My vision for the BSC is to improve health through strategies of basic research, public health measures, and commercial development. SDSU research professor Ed Morgan discusses vaccinations, their scarcity and why they are important. Construction is scheduled to be complete by June 15. Invitations have been sent out for the celebration of the Donald P. Shiley Cardiovascular Research Center which will take place on July 15. We hope it will be a memorable occasion. With the imminent completion of the BSC's third floor, we have made a significant advance toward assembling the full team of collaborative investigators. Darlene Shiley is giving new meaning to a gift from the heart by donating $1.25 million in her husband's name to San Diego State University for heart disease research. The BioScience Center has assembled a team of investigators to explore the link between gum and heart diseases. Members of the Gottlieb Lab and collaborators from Scripps Research Institute published a paper reporting potentially dangerous effects of a drug that binds to a specific receptor for the bioactive lipid sphingosine-1phosphate (S-1-P). Dr. Gottlieb and Dr. Frey presented work at the Frontiers in Mitochondrial Research meeting held in Italy November 25-29. "This event was a great opportunity to explore this new area of study in heart disease," said Stanley Maloy, dean of the College of Sciences and former president of the American Society for Microbiology. San Diego State University researchers at the Donald P. Shiley BioScience Center may have found the secret to helping the immune system fight off the flu before it gets you sick. A new study published today in the Public Library of Science journal PLoS ONE, finds that EP67, a powerful synthetic protein, is able to activate the innate immune system within just two hours of being administered. Prior to this study, EP67 had been primarily used as an adjuvant for vaccines, something added to the vaccine to help activate the immune response. But Joy Phillips, a lead author of the study with her colleague Sam Sanderson at the University of Nebraska Medical Center, saw potential for it to work on its own. "The flu virus is very sneaky and actively keeps the immune system from detecting it for a few days until you are getting symptoms," Phillips said. "Our research showed that by introducing EP67 into the body within 24 hours of exposure to the flu virus caused the immune system to react almost immediately to the threat, well before your body normally would." Because EP67 doesn't work on the virus but on the immune system itself, it functions the same no matter the flu strain, unlike the influenza vaccine, which must exactly match the currently circulating strain. Phillips said while this study focuses on the flu, EP67 has the potential to work on other respiratory diseases and fungal infections and could have huge potential for emergency therapeutics. "When you find out you've been exposed to the flu, the only treatments available now target the virus directly but they are not reliable and often the virus develops a resistance against them," Phillips said. "EP67 could potentially be a therapeutic that someone would take when they know they've been exposed that would help the body fight off the virus before you get sick." 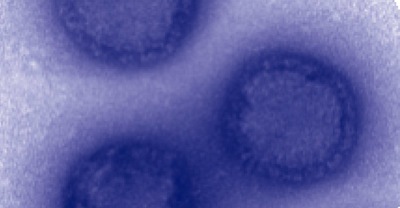 It could even be used in the event of a new strain of infectious disease, before the actual pathogen has been identified, as in SARS or the 2009 H1N1 influenza outbreak, Phillips said. Testing focused primarily on mice by infecting them with a flu virus. Those that were given a dose of EP67 within 24 hours of the infection didn't get sick (or as sick) as those that were not treated with EP67. The level of illness in mice is measured by weight loss. Typically, mice lose approximately 20 percent of their weight when they are infected with the flu but mice treated with EP67 lost an average of just six percent. More importantly, mice who were treated a day after being infected with a lethal dose of influenza did not die, Phillips said. She said there are also huge implications for veterinary applications, since EP67 is active in animals, including birds. Future research will examine the effect EP67 has in the presence of a number of other pathogens and to look closer at exactly how EP67 functions within different cells in the body.